or the Village and oceanfront homes on the Esplanade. Located along some of Southern California’s finest beaches, Redondo Beach has something to offer everyone. Bordered by the Palos Verdes Peninsula to the south, Hermosa Beach to the north, and Torrance to the east, Redondo Beach offers great schools, proximity to the beach, and an abundance of activities. Some highlights include ocean activities and dining at King Harbor, great shopping in the Riviera Village, the Redondo Beach pier, and nature walks at Wilderness Park. Some of the areas of Redondo include North Redondo with anbundance of home options, South Redondo, the Hollywood Riviera , the resort living of The Village and SeascapeOceanfront Condominiums, oceanfront condos on the Esplanade and the Golden Hills. There are endless reasons that the South Bay and Redondo Beach are great places to live, and without question the proximity to the ocean is one of them. Redondo Beach offers a wider variety of options than neighboring Hermosa Beach and Manhattan Beach as it’s zoned to allow higher density housing in some areas…..meaning larger condo complexes. Some of the most ideal complexes are located in South Redondo Beach just off of Catalina and are known as the Village or Seascapes I, II and III. All of the Seascape Buildings are also known as the Village (they’re actually all on Catalina but the addresses are on The Village) All of the complexes have Homeowners Associations with relatively high HOA dues to cover the various landscaping, pools and some insurance, but if you’re looking for an affordable way to have a beach home, they may be ideal for you. All three buildings offer some fantastic ocean, Catalina, and harbor views and are centrally located just a short walk or bike ride to the beach, marina, restaurants and shops and parks. Keep in mind that some of my comments are just opinions on what is both good and bad about the buildings based on my observations and feedback from my clients. Seascape One is actually located between Seascapes II and III and consists of 210-250 The Village. It was built in 1978 and is just east of King Harbor and the Redondo Beach pier. Many of the units have fairly unique windows that allow for plenty of light and breezes. The smallest units are 1 bedroom 1 bath with around 577 square feet with the largest units being 2 bedroom 2 bath with just over 1600 feet. Values depend primarily on the location and view as well as the upgrades that the owners have done over time. Pros: Location, location, location. Seascape I is central to everything and you truly don’t have to get in the car on the weekends. It’s directly adjacent to the marina and the Redondo Beach pier and has a large grassy park just outside your door. Some of the units are very nicely remodeled and some have tremendous ocean views (although those unblocked view units rarely come on the market. This is an affordable way to live by the beach or use a rental unit. See additional pictures of an ocean view unit at 240 The Village. buildings. The complex has a very nice pool area and is walkable to just about everything imaginable. Seascape 2 also has some townhome units with larger square footage and attached garages. 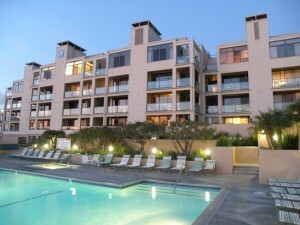 Many/most of the units have been extensively remodeled and many have stunning ocean and harbor views. Cons: There are often assessments and the monthly HOA is fairly high and currently around the mid $400s as of this article. It’s a fairly large complex and often a bit confusing to find your way around. Although the views can be stunning some of the units are a bit further back with a service road and a few buildings in front of the views of some of the lower units.